Hamilton Animal Products, Partrade: Horse Halters, Leads, Lunge Line! • 1" Nylon Halter with Adjustable Chin Snap: Each halter is constructed with over 16 feet of 100% Premium Nylon web, double sewn and triple-thick. Its 100% nylon thread is sewn in a diamond tack design to give the halter form and rigidity for a superior fit. It is significantly stronger than stitching in a single line or with a usual bar tack. Five solid brass eyelets attached in burn holes give the halter a double wall of safeguard against eyelet fray. The three double-welded rings, two custom stress point squares and one double bar head buckle are designed to sit much flatter on the horse's head and eliminate any contact irritation. Rolled throat for comfort. Adjustable chin strap allows halter to be used on multiple horses.The 1D Halters include a solid brass tip which makes buckling easier than ever before. It also gives the distinctive look that makes it a Hamilton Halter. Yrl. 300-500 lbs. 1DA. ORDER NOW! • 1" Nylon Halter with Adjustable Chin Snap: YEARLING (300-500 lbs.) #1DA. • 1" Nylon Halter with Adjustable Chin Snap: AVERAGE HORSE (800 - 1100 lbs.) #1DA. • 1" Nylon Horse Halter: The Hamilton Halter is a picture of strength and beauty with a distinctive look that has been widely accepted by horse owners throughout America. Each halter is made of over 16 feet of 100% nylon web, double sewn and triple-thick. Its 100% nylon thread is sewn in a diamond tack design to give the halter form and rigidity for a superior fit. It is dramatically stronger than stitching in a single line or with a conventional bar tack. Five solid brass eyelets attached in burn holes give the halter a double wall of protection against eyelet fray. The three double-welded rings, two custom stress point squares and one double bar head buckle are designed to sit much flatter on the horse's head and eliminate any contact irritation. The 1D Halters come with a solid brass tip which makes buckling easier than ever before. #1D. ORDER NOW! • 1" Nylon Horse Halter: SMALL HORSE or Cob (500 - 800 lbs.) #1D. • 1" Nylon Horse Halter: LARGE HORSE (1100 - 1600 lbs.) #1D. • ¾" Nylon Halter with Adjustable Chin Snap: ¾" Wide strap is perfect size for Foals, Weanlings, Yearlings, and Average or Large miniature horses. Solid brass hardware. Adjustable strap around chin provides extra snugness and comfort. Thick, durable 100% Premium Nylon straps will withstand some abuse. Adjustable harness has five loops to adjust to. Resistant to fading and bleeding. Quilted box stitching to maintain their shape and is used to provide durability. Rolled throat adds to comfortable fitting harness. Premium webbing is custom dyed to offer dazzling colors. ORDER NOW! • ¾" Nylon Halter with Adjustable Chin and Throat Strap (Weanling/Arabian): Perfectly sized for Arabian horses . Made with durable double and triple ply 100% nylon ¾" nylon and completed with brass finished buckles and hardware. Adjustable noseband with throat snap and brass eyelets in crown provide ease of adjustment. These great looking halters are strong, well made and fit well. Fine quality and style accent the Arabian head making these halters as attractive to wear as it is and durable to use. Rolled throat adds to comfortable fitting harness. Premium webbing is custom dyed to offer dazzling colors. #3DA. #8DA. ORDER NOW! • 1" Nylon Halter (Draft Horse): Made with 100% triple-thick premium nylon web, double sewn and triple-thick for unparalleled quality. Its 100% nylon thread is sewn in a diamond tack design to give the halter form and rigidity for a superior fit. Five solid brass eyelets attached in burn holes give the halter a double wall of protection against eyelet fray. The three double-welded rings, two custom stress point squares and one double bar head buckle are designed to sit much flatter on the horse's head and eliminate any contact irritation. Rolled throat for comfort. Easy to adjust the nose band and the clip makes it easy to put on the horse and take off. High break resistant hardware. Comes with a solid brass tip which makes buckling easier than ever before. #1D. ORDER NOW! • ¾" Quality Halter (Foal/Pony/Weanling): Each Quality Halter is made of 100% triple-thick premium nylon web, double sewn and triple-thick for unparalleled quality. Its 100% nylon thread is sewn in a diamond tack design to give the halter form and rigidity for a superior fit. The three double-welded rings, two custom stress point squares and one double bar head buckle are designed to sit much flatter on the horse's head and eliminate any contact irritation. Rolled throat for comfort. Easy to adjust the nose band and the clip makes it easy to put on the horse and take off. High break resistant hardware. Comes with brass plated hardware. #3Q. ORDER NOW! • 1" Quality Halter (Yearling/ Small Horse/Average Horse/Large Horse): Each Quality Halter is made of 100% triple-thick premium nylon web, double sewn and triple-thick for unparalleled quality. Its 100% nylon thread is sewn in a diamond tack design to give the halter form and rigidity for a superior fit. The three double-welded rings, two custom stress point squares and one double bar head buckle are designed to sit much flatter on the horse's head and eliminate any contact irritation. Rolled throat for comfort. Easy to adjust the nose band and the clip makes it easy to put on the horse and take off. High break resistant hardware. Comes with brass plated hardware. #1Q. ORDER NOW! • Cowboy Braid Lead: 10 ft braided lead rope. Use as a lead for horses. 5/8 Cowboy Braided Rope. Polypropylene Rope with Malleable Snap. Black. ORDER NOW! Cotton Rope Lead w/ Nickel Bull* Snap: 3/4 inch thick soft cotton rope lead. used for leading goats, sheep, alpaca, llama, horses, cows and other medium to large animals. All hardware is strength-tested to prevent against rust, tarnish or breakage ORDER NOW! • Cotton Rope Lead w/ Nickel Bull Snap Black: BLACK. 10 ft. Lead. #CL34N BK. ORDER NOW! • Cotton Rope Lead w/ Nickel Bull Snap Red: RED. 10 ft. Lead. #CL34N RD. ORDER NOW! * Bull Snap has a hinge feature. 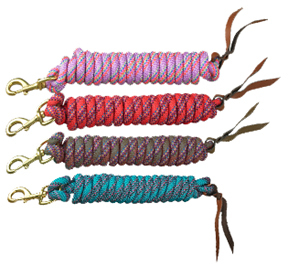 Cotton Rope Lead w/ Brass Bolt Snap: 3/4 inch thick soft cotton rope lead. used for leading goats, sheep, alpaca, llama, horses, cows and other medium to large animals. All hardware is strength-tested to prevent against rust, tarnish or breakage ORDER NOW! • Cotton Rope Lead w/ Brass Bolt Snap Dark Green: DARK GREEN. 10 ft. Lead. #CL34B. ORDER NOW! • Cotton Rope Lead w/ Brass Bolt Snap Blue: BLUE. 10 ft. Lead. #CL34B BL. ORDER NOW! • Cotton Rope Lead w/ Brass Bolt Snap Red: RED. 10 ft. Lead. #CL34B RD. ORDER NOW! • Cotton Rope Lead w/ Brass Bolt Snap White: WHITE. 10 ft. Lead. #CL34B WH. ORDER NOW! * Bolt Snap has a spring feature. Extra Heavy Poly Rope Lead: Hamilton Extra Heavy Poly Rope Lead with brass Bolt Snap, Confetti Weave. Use as a lead for horses. Hamilton webbing is 100% first run, professional grade and outperforms all others in strength, flexibility and durability. Nylon webbing is custom dyed to reduce fading and bleeding. Brushed nickel matte finish on swivel bolt snap. It's heavy duty, super strong and very easy to grasp and hold on to. 5/8" Thick x 10' Long. ORDER NOW! • Extra Heavy Poly Rope Lead Confetti/Berry Blue: CONFETTI / BERRY BLUE. 5/8" X 10'. #PL58B. ORDER NOW! • Extra Heavy Poly Rope Lead Confetti/Dark Green: CONFETTI / DARK GREEN. 5/8" X 10'. #PL58B. ORDER NOW! Extra Heavy Poly Rope Lead: Hamilton Extra Heavy Poly Rope Lead with brass Bolt Snap used as a lead for horses. Hamilton webbing is 100% first run, professional grade and outperforms all others in strength, flexibility and durability. Nylon webbing is custom dyed to reduce fading and bleeding. Brushed nickel matte finish on swivel bolt snap. It's heavy duty, super strong and very easy to grasp and hold on to. 5/8" Thick x 10' Long. ORDER NOW! • Extra Heavy Poly Rope Lead Berry Blue: BERRY BLUE. 5/8" X 10'. #PL58B. ORDER NOW! • Extra Heavy Poly Rope Lead Hot Pink: HOT PINK. 5/8" X 10'. #PL58B. ORDER NOW! • Extra Heavy Poly Rope Lead Lavender: LAVENDER. 5/8" X 10'. #PL58B. ORDER NOW! • Extra Heavy Poly Rope Lead Lime: LIME. 5/8" X 10'. #PL58B. ORDER NOW! • Extra Heavy Poly Rope Lead Mango: MANGO. 5/8" X 10'. #PL58B. ORDER NOW! • Extra Heavy Poly Rope Lead Lemon Mango: LEMON MANGO. 5/8" X 10'. #PL58B. ORDER NOW! Lead Cotton: 10' X 3/4" Cotton Lead, comes with 1-1/8" Solid Brass Bolt Snap Without Clamp. • Lead Cotton DARK GREEN: DARK GREEN. / 10 ft. w/ 1-1/8" Solid Brass Bolt Snap. #248066. ORDER NOW! • Lead Cotton PURPLE: PURPLE. / 10 ft. w/ 1-1/8" Solid Brass Bolt Snap. #248066. ORDER NOW! • Lead Cotton ROYAL BLUE: ROYAL BLUE. / 10 ft. w/ 1-1/8" Solid Brass Bolt Snap. #248066. ORDER NOW! Lead Poly: 9' x 5/8" Brass Plated 7/8" Bolt Snap with clamp. • Lead Poly BLACK: BLACK. 9' x 5/8" Brass Plated 7/8" Bolt Snap w/clamp. #248248.ORDER NOW! • Lead Poly RED: RED. 9' x 5/8" Brass Plated 7/8" Bolt Snap w/clamp. #248250. ORDER NOW! • Lead Poly PINK/RASPBERRY: PINK/RASPBERRY. 9' x 5/8" Brass Plated 7/8" Bolt Snap w/clamp. #248881. ORDER NOW! • Lead Poly PURPLE/LAVENDER: PURPLE/LAVENDER. 9' x 5/8" Brass Plated 7/8" Bolt Snap w/clamp. #248882. ORDER NOW! Lunge Line Cotton: 25' X 1/2" Cotton Lunge, comes with 1-1/8" Solid Brass Bolt Snap Without Clamp. Designed for long hours of use. ORDER NOW! • Lunge Line Cotton WHITE: WHITE / 25 ft. w/ Brass Bolt Snap. #248170. ORDER NOW! • Stud Chain: 30 inch. NP. #196230. ORDER NOW! 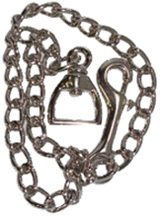 • Chain End Twitch: 17 inch. Rust-resistant steel chain with Wood handle. #244010. ORDER NOW! Nylon Lunge Line w/ Snap: 26' Length X 1" width with Snap. Strength tested hardware and custom dyed fade resistant nylon. #23D. ORDER NOW! • Nylon Lunge Line w/ Snap C: BLACK. 26' Length X 1" width with Snap. #23D. ORDER NOW! • Nylon Lunge Line w/ Snap C: BLUE. 26' Length X 1" width with Snap. #23D. ORDER NOW! Cotton Rope Lead: 10 ft Lead, 3/4″thick soft cotton rope lead with Bolt Snap . All hardware is is strength-tested to fight against rust, tarnish or breakage. #CL34B. ORDER NOW! • Cotton Rope Lead C: STRIPE PINK. 10 ft Lead, 3/4″thick soft cotton rope lead with Bolt Snap. #CL34B MSHP. ORDER NOW! Cowboy Poly Rope Lead Braided: 5/8" wide. 1st run 100% webbing, professional grade. High thread count results in unmatched feel. All hardware is is strength-tested to fight against rust, tarnish or breakage. #CL34B. ORDER NOW! • Cowboy Poly Rope Lead Braided C: WEAVE BROWN. 5/8″wide. #BL58B WVBR. ORDER NOW! • Cowboy Poly Rope Lead Braided C: WEAVE LAVENDER. 5/8″wide. #BL58B WVLV. ORDER NOW! • Cowboy Poly Rope Lead Braided C: WEAVE OCEAN. 5/8″wide. #BL58B WVOC. ORDER NOW! • Cowboy Poly Rope Lead Braided C: WEAVE RED. 5/8″wide. #BL58B WVRD. ORDER NOW! Poly Rope Lead: 10 ft. x 5/8" wide with Bolt Snap. Nylon webbing is custom dyed to reduce fading and bleeding and outperforms all others in strength, flexibility and durability. #CL34B. ORDER NOW! • Poly Rope Graphite: GRAPHITE. 10 ft. x 5/8" wide with Bolt Snap. #PL58B GT. ORDER NOW! • Poly Rope Lead Plum: PLUM. 10 ft. x 5/8" wide with Bolt Snap. #PL58B PM. ORDER NOW! • Poly Rope Lead Dark Green: DARK GREEN. 10 ft. x 5/8" wide with Bolt Snap. #PL58B DG. ORDER NOW! • Poly Rope Lead Navy: NAVY. 10 ft. x 5/8" wide with Bolt Snap. #PL58B NV. ORDER NOW! • Poly Rope Lead Ocean: OCEAN. 10 ft. x 5/8" wide with Bolt Snap. #PL58B OC. ORDER NOW! • Poly Rope Lead Purple: PURPLE. 10 ft. x 5/8" wide with Bolt Snap. #PL58B PU. ORDER NOW! • Poly Rope Lead Red: RED. 10 ft. x 5/8" wide with Bolt Snap. #PL58B RD PM. ORDER NOW! • Poly Rope Lead Stripe Red Navy TanC: STRIPE RED NAVY TAN. 10 ft. x 5/8" wide with Bolt Snap. #PL58B S RD. ORDER NOW! HALTERS/LEADS: Cotton Rope Lead w/ Bolt Snap 10 ft.
HALTERS/LEADS: Cowboy Poly Rope Lead Braided Weave 5/8"
HALTERS/LEADS: Poly Rope Lead 10 ft x 5/8"